A simply stunning and attracting wordpress theme, the Scroll WordPress theme is a unique, one of a kind theme. The name of the theme itself describes the theme and its idea of design. The theme has a dark brown backdrop with the rest of the theme designed in the style of a scroll belonging to the ancient times made of papyrus leaves of light brown color. The theme has distinct header comprising of a few printed designs in it. 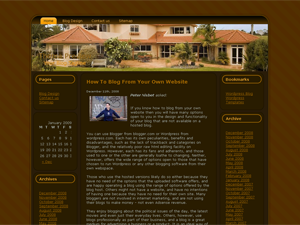 The header also comprises of a traditional navigation bar that links you with the other categories of the blog. This is also a two columned, fixed width theme. 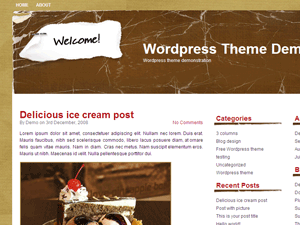 The theme has a sidebar at the left side of the theme which also comprises of a distinct search area. This beautiful and interesting wordpress theme was designed by Ophelia Nicholson. Brown House wordpress theme is a perfect design for a realestate agency web site or someone who is into house building, decorating, exterior decorating, etc. Also the template would be well suited for a vacation rentals blog. 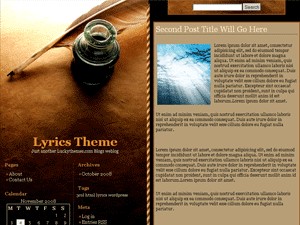 This is a 3 column wp theme with sidebars on both sides. The left sidebar supports wordpress widgets the right one displays your blogroll and archive. 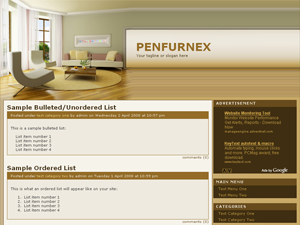 Main content area (in the middle) has white text and brown background. The header graphic features a big luxury and modern house. Brown House wordpress template was submitted by an anonymous so we don’t know who the original designer is.